Update: Freedom 251 will be priced at Rs. 251, which makes it one of the cheapest phone in India. It features a 4-inch display and is powered by 1.3GHz quad-core processor accompanied with 1GB RAM and 8GB internal storage which is expandable up to 32GB. It also sports a 3.2-megapixel primary camera and a 0.3-megapixel front camera. Freedom 251 is equipped with a 1450mAh battery. 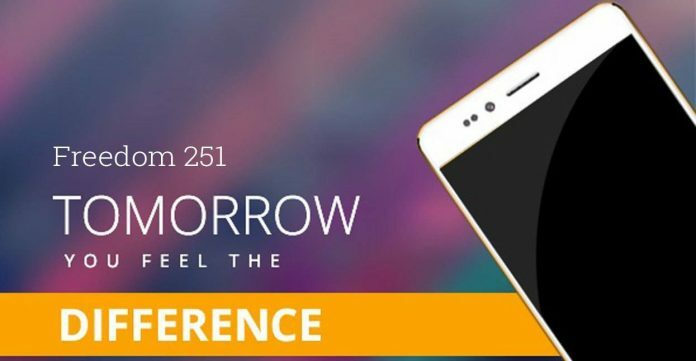 India’s cheapest phone, i.e., Freedom 251, from an Indian company, Ringing Bells, is finally set to launch tomorrow for mere Rs. 250. The phone is completely assembled and manufactured in India, so you can call it a ‘made in India’ phone. Detailed information about the phone has not been revealed yet and will be disclosed on the launch event tomorrow which will be inaugurated by Honorable Defense Minister Manohar Parrikkar. As the price tag goes, it is obvious that the phone will have only basic features. According to the company, this phones is the first towards the vision of India Prime Minister Narendra Modi’s, where he wants to connect every Indian. Ringing Bells was established in 2015 and has already launched 3 exclusive phones that are featured rich and carry a very minimal price tag. The latest one was Smart 101, which is 4G enabled and has some decent specifications and is priced for Rs. 2,999. The other two phones are Ringing Bells 4u and Ringing Bells Master which are priced at Rs. 799 and Rs. 999 respectively. Smart101 has gained a lot of popularity because of its low price and decent specifications. It features a 5 inch IPS display with qHD display. It is powered by quad core processor and has 1GB of RAM. The internal storage is 8GB and has support for micro SD card. It sports a 8MP primary camera and a 3.2MP front camera. Along with this it is equipped with 2,800mAh battery. Overall at a price of mere Rs. 2,999 Smart101 is a steal. It will be very exciting to see what Freedom 251 has to give to its customer for mere Rs. 251. The more information about the phone will be unveiled tomorrow and we will be updated this article as soon as possible. So stay tuned with us.